There’s a new townhouse condo development in the works on Lake Shore Boulevard West in the South Etobicoke neighbourhood of Long Branch. I just happened to be in the neighborhood the day the units were available to buy. Out of curiosity, I stood in the long line in front of the presentation center, among many eager investors. After leaving with a bundle of papers and a shiny booklet, I couldn’t help but scoff at the marketing materials for these tiny townhouses. Pitching Long Branch as an elite and exclusive neighbourhood based on trends in other cities is unconvincing. After all, Toronto is not Detroit or Chicago. Exclusive and elite residential districts in Toronto typically do not hug the shoreline. This past August, Toronto Life released their ranking of city neighbourhoods. Of the top five (Rosedale – Moore Park, Banbury – Don Mills, High Park – Swansea, Mount Pleasant West, High Park North), only one happens to touch shoreline (High Park – Swansea). It should also be noted that the Minto development is on the north side of Lake Shore Boulevard West – with no view of the lake. 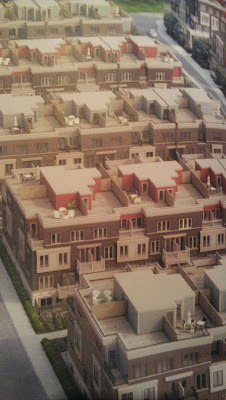 These townhouses are approximately a kilometer away from water (see the map below). Considering you’re looking at a 30 minute drive (if you’re lucky) or an hour long TTC commute (again, if you’re lucky) downtown from Long Branch, the Go Train is a favourable form of transportation. And, if you opt for the Go Train over driving, you’ll save yourself a $25,000 + HST parking space. However, considering the fact that the train tracks will be in your backyard, you may grow a love-hate relationship with the Go Train and its frequent schedule. Lakeshore West trains now run every half hour. So let me ask you - how much do you value peace and quiet? Minto believes a $10,000 price deduction for units closest to the train tracks is fair – would you agree? Let’s talk about cars. And traffic. During rush hour, there is congestion along Lake Shore Boulevard. That’s no surprise – it’s difficult to find a place in the city that doesn’t have traffic during rush hour. Currently cars and buses are backed up on Browns Line and all the way down Lake Shore Boulevard, so you can only imagine how a complex that is adding all these new townhouse dwellers will affect traffic in Long Branch. All that exhaust of cars sitting in traffic - sounds very ‘green’, doesn’t it? Unfortunately, the townhouse dwellers, living so close to Lake Shore Blvd W. will be those who suffer the worst. 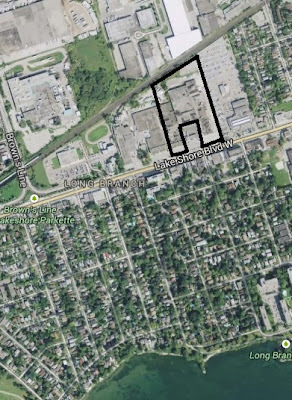 Again, considering the border of this property: Castrol oil plant, the 24-hour 501 streetcars rumbling along Lake Shore Boulevard, the Beer Store crowd, Go Train tracks… this is exactly where I’d love to relax on a rooftop patio. But that’s just my opinion. Perhaps you may believe that being so far from downtown allows for the opportunity for stargazing. That’s just not the case. The light pollution from the car dealership and streetlights that are currently in place makes star gazing impossible. Now consider all the additional light from this development and that canopy of twinkling stars fades into wishful thinking. The computer generated outdoor living spaces look wonderfully spacious in the glossy book – but in reality these terraces account for a large portion of the square footage of each townhouse. The smallest unit is 515 square feet (was sold for ~$212,000) – and I’d approximate that 20% of that square footage is the terrace/balcony itself… which would be fine if we lived in a country without at least six months of cold, wintery weather. A living space that is only livable half the year is, in my opinion, wasted space. But what about the unit interiors? Have you ever come across a condo that couldn’t be described with that exact phrase? Marie Curtis is about to become the new dumping zone for Mississauga fill thanks to the Lakeview Waterfront Connection Project. Say goodbye to the sandy beach that’s currently there – soon it will be filled with rocks and waste. It is my sincere wish that those who do purchase a Minto townhouse lobby against this development, if not to preserve value in their investment then to help save the much loved beach at Marie Curtis. The booklet goes on to feature three dining establishments – Woody’s Burgers, Empanda Company and Fair Grounds Cafe. It should be noted that these three shops are the exception, not the rule – in fact, this stretch of Lake Shore Boulevard was referred to as “gritty” by the Globe and Mail. Overall, I was surprised how much of the marketing material focused on upselling the neighbourhood. Look – I’m not trying to knock Long Branch. It’s a great area – but is it the next up-and-coming trendy place to be? In case you were wondering, Long Branch rated as #99 on Toronto Life’s ranking. I believe that Minto is painting a very rosy picture in order to sell units – period. So what do you think? 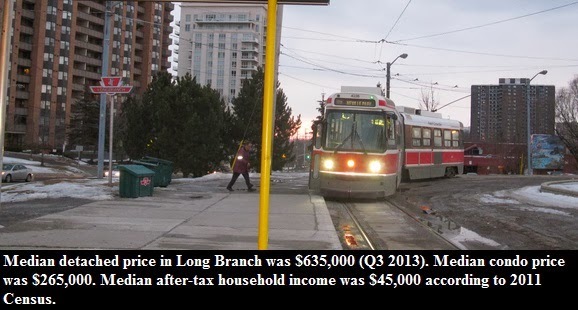 Is Long Branch an up-and-coming neighbourhood? Would you purchase a Minto townhouse condo as an investment, or to live?